I REALLY LOVE THE MEMORIAL BRACELET. IT IS EXCATLY WHAT I WANTED AND THE QUALITY IS GREAT. THE REASON THAT I BOUGHT THIS BRACELET. WELL, LET ME TELL YOU A LITTLE ABOUT ME. I WENT TO IRAQ IN FEB.2004 AND COME BACK IN FEB.2005. DAVID WAS A CLOSE FRIEND OF MINE. I WORKED WITH HIM FOR SEVERAL YEARS. HE WAS PRIOR SERVICE (MARINES). 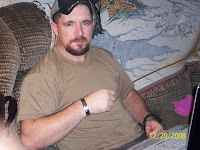 WHEN WE GOT BACK FROM IRAQ, HE JOINED THE NATIONAL GUARD THAT I WAS IN. I WAS HIS TEAM LEADER FOR ABOUT 8 MONTHS THEN I GOT OUT (MEDICAL DISCHARGE). THEN A FEW MONTHS LATER THE UNIT WAS DEPLOYED AGAIN. HE HAD BEEN IN COUNTRY (IRAQ) FOR A FEW MONTHS WHEN HE WAS KILLED BY ROAD SIDE BOMB. HE WAS KILLED INSTANTLY. I THANK GOD THAT HE DIDNT HAVE TO SUFFER AT ALL. I AM INCLUDING A PIC OF ME WITH IT ON. I LOOK KIND OF ROUGH THOUGH BUT I GUESS THAT IT WILL HAVE TO DO. I WILL RECOMEND YOU TO EVERYONE THAT I KNOW. WELL, I CLOSE FOR NOW AND AGAIN THANK YOU. YOU DID A GREAT JOB ON THE BRACELET.